It's amazing how much you can learn at the annual Southeast Deer Study Group Meeting. Every year, the top deer researchers in the world present the latest information on whitetails, and it's open to the public. The Conservation Department of Missouri did a great job hosting the 2017 meeting, where there were 56 presentations. Here are the ones I believe will be of most interest to bowhunters. We keep learning there is always something to learn about whitetails. Graduate student Dan Morina from Mississippi State University had one of the more innovative and interesting presentations. He wanted to know if bigger antlers impressed estrous does. Working in pens, he manipulated antler size but controlled body size and age, and then allowed 25 estrous females to choose between segregated pairs of bucks with either large or small antlers. He paired 11â„2-year-old and 61â„2-year-old bucks of the same weight. Then, using tape and screws, he attached large antlers that scored 163 and small antlers that scored 63 inches to young and old bucks with big and small antlers. Then he placed pairs of bucks in pens on either side of a penned estrous doe. The estrous females were left there for 36 hours, and the amount of time she spent next to each buck was measured. The results were overwhelming. Whether animals were walking or bedded, the does almost always chose the buck with the biggest antlers. They concluded that big antlers provide a signal of genetic quality to females. Neat study. Erin Watson, a graduate student at the University of Georgia, was interested in learning just how well deer see. Yes, we know that deer have great eyesight, but Erin found some clues as to why. It turns out that deer process visual images at a faster rate than humans, making them much more sensitive to movement than humans. In fact, she learned that their ability to receive visual information (and thus see movement better) is four times better than humans at sunrise and sunset. So, not only do deer see movement better than we do, they see movement better at the critical hunting times of dawn and dusk. How often have you heard someone say that there were poor antlers in one area because there was poor soil? Poor soil means plants get poor nutrients, and thus deer do too. Dr. Craig Harper from the University of Tennessee addressed the question of whether poor soils limit plant quality. He looked at 11 deer forage plant species in 12 states with a wide range of soil quality. He was particularly interested in crude protein, potassium, phosphorus, and calcium. Did the availability of these nutrients in plants and the amount of growth of these plants vary with soils? The results were surprising, and conclusive. Soil quality had almost no relationship to forage quality. Soil productivity did not alter plant nutrients in pokeweed, sumac, ragweed, and many other tested species. Soil nutrients are a weak predictor of forage nutrients. Dr. Harper's conclusion is to manage for high-quality forbs, rather than worry about soil minerals relative to deer getting adequate nutrition. Jason Summer, Wildlife Chief of the Missouri Department of Conservation. He noted that from 2002-2004, Missouri tested 22,000 deer and found no CWD. From 2007-2011, they tested 16,000 wild harvested deer. No CWD. In fact, the first CWD-positive deer in Missouri was found on a fenced hunting preserve in February 2010. In October 2011 two more were found on another shooting preserve 15 miles from the first one. Then in January 2012, two free-range deer tested positive. Further testing of 658 deer showed five free-range deer positive, and all were within two miles of the original infected facility. So, 38,000 tested deer throughout the state and no CWD, then several in fenced farms, and suddenly there are CWD deer around that first farm. Cory Gray of the Arkansas Game and Fish Commission presented data on their CWD problem. They found their first CWD wild deer in February 2016. But CWD had obviously been present for years, because in March they killed 266 deer in a 125,000-acre area and 23 percent were positive. Today CWD has been found in 212 deer and elk, and there is no baiting allowed from September to December in a 10-county area. Both Arkansas and Missouri have eliminated antler restrictions in their CWD counties because we know that a high percentage of yearling bucks disperse long distances, so increasing their kill will help slow the spread of CWD. If you run a baited camera survey in August, will the pictured bucks still be there three months later? That's the question that James Johnson of the University of Georgia focused on. He found that around 20 percent were not photographed thereafter. In addition, he found that some new bucks appeared in the hunting season that had not been previously photographed. Although August camera surveys are worth doing, they won't give you a 100-percent account of what you might see in November. Rebecca Shuman of the Florida Fish and Wildlife Conservation Commission, and Jared Beaver of Texas A&M University, updated attendees on the loss of endangered Key deer due to a screwworm infestation. This once-common parasite of deer in Texas and Florida had been eliminated until this recent local outbreak in southern Florida. Around 25 percent of the total population in the area died, with 91 percent being bucks. Bucks are more susceptible because of open wounds related to breeding behavior. These wounds allow the fly to lay eggs, and hatching larvae eat the flesh. However, officials jumped on it and released 101 million sterile flies at 25 sites. This played a major role in eliminating the threat. Summer Higdon from the University of Missouri found that does with fawns were more active during the day, thus avoiding the times when coyotes were most active (dawn and dusk). Apparently, they've learned to adjust their activity to avoid coyotes. Does without fawns were most active at dawn and dusk. I wonder if does with fawns in the East, where coyote numbers are rising, are also becoming more active at midday? Dr. David Stallknecht, who works at the Southeastern Cooperative Wildlife Disease Study, knows more about epizootic hemorrhagic disease (EHD) than anyone in America. He put together drought and incidence of EHD data, and found a high correlation for most states. Only in the Southeast did the correlation not hold up. Bottom line is if you have a summer drought, there's a much better chance of experiencing an outbreak of EHD in early fall. The more severe the drought, the higher the probability that some deer will die of EHD, except in Southern states. One last disappointing tidbit from the meeting. John Organ with the U. S. Geological Survey Cooperative Fish and Wildlife Research Units noted that 30 years ago conservation was two percent of the federal budget. Today it is 0.1 percent. The 2018 meeting will begin in Nashville, Tennessee, on February 19, and will be hosted by the Tennessee Wildlife Resources agency. 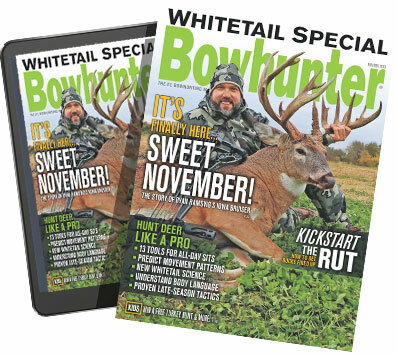 I know that Bowhunter Magazine will be there, and I hope that you will be too.